Invasive Beetle Survey Finds Infestation Along Merrimack River, NH. Concord NH A survey is now underway in Concord, to determine how far an infestation of invasive beetles has spread. The Emerald Ash Borer has been detected in trees up and down the Merrimack River in Concord. But so far the survey has not found any of the pests outside of a six-mile radius of the city. The city has been divided into quarter mile squares. 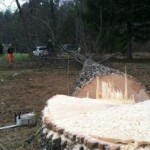 In each square, surveyors try to find two ash trees within a quarter mile radius. On a plot out on the heights, just past the Steeplegate Mall, Adam Taschereau and Randy Marcotte with the Division of Forested Lands searched for trees to survey. "That's white oak, that's white oak, and that's not Ash," says Taschereau, surveying the trees. It's not always easy to find Ash, as these surveyors will tell you. In Concord the trees tend to be clustered along the Merrimack, because "hey kind of want their feet a little wet" according to Marcotte. There aren't any in this plot, but when surveyors find trees, the next step is to take some branches. Sawyers take limbs from near the crown of the tree, since the Ash borer infests from the top and work their way down. The logs are brought to a warehouse where officials and volunteers peel back the bark. "We're stripping the bark off in layers and sections so that we don't miss something like this. If we just peeled all the bark back we might miss some of the young galleries," says Cheryl Smith from the UNH cooperative extension, who's helping out today. A gallery is the sinuous, winding path, eaten under the bark by the beetle larva. It looks a bit like a winding river as seen from a satellite. Kyle Lombard from Division of Forested Lands shows where EAB has been detected, mostly along the Merrimack River points completed, we have about a three mile stretch right along the river, that we have infested trees. So we can't find anything out here, can't find anything out here, but we have found stuff really tight to the river. Which is expected because that's where all the ash is." For the better part of this month officials have been conducting this 3-mile radius survey around the first tree discovered. It should be finished by the end of this week, and that's important because in May, the borer larva will emerge as beetles and take flight looking for new trees to infest. So if officials are going to slow the insect's spread, they have to act fast. Even as the survey around Concord is happening, land-owners are calling in to tell officials about suspect trees, besieged by woodpeckers. Lombard heads out to Hopkinton to check on one. "It's outside of the six mile radius, which makes us nervous so we're going to cut it down just to see what it is," he explains, "We're hoping that it's just native wood-borers, but if it isn't then it's a game-changer." 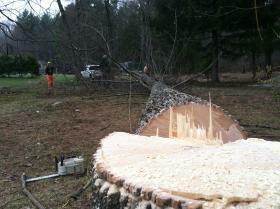 If it is Emerald Ash Borer, the survey will have to be reset, widening it's scope. Lombard and a colleague fell the tree quickly, and the second it's down, Lombard is on it, peeling off the bark. "That's native," he says eying a distinctly different boring pattern. False alarm, on this tree. But the extent of the borer infestation is still to be determined. Linda Robert on Exotic Wildlife and Plants - OK to Enjoy, but Be Responsible! Adrian Kelly on How Accurate are Zillow Pricing Estimates?